Finding Eden: We got this! We continue to find things on the bus that need to be fixed, swapped out, changed altogether or new items that we want to make the bus more comfortable. Stuff like new tires and some minor front end work (which requires a place to stay while the work actually gets done). Stuff like winterizing the bus (adding insulating inserts to the floors and windows and buying a furnace) and storing or finding a new spot for our hot weather stuff. Sorting out how we are gong to lift the solar panels each day as the days get shorter to maximize our solar power (should we buy a ladder and mount it to the back or put toe holds up the side of the bus). Installing a propane tank outside of the bus for our furnace and cooking and possibly one day a hot water on demand tank. Finishing up odd jobs that we started like the passenger door mechanism, or the spare tire mount . Installing speakers for the new stereo and finishing a logo Michael has been working on and having it put on the bus. There is still so much to do and it seems like we are getting there so slowly! But we are getting there! Sometimes I have to tell myself that! We have a goal and it's taking a little (okay a lot) longer to get there than we had hoped. 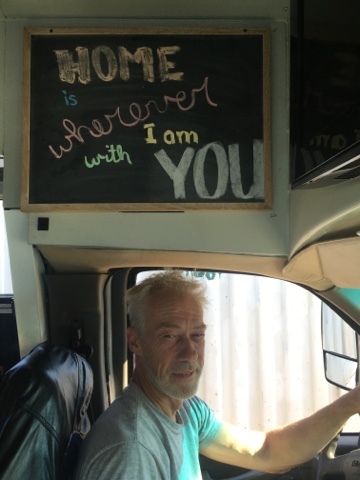 But we are still heading towards that goal and will have a safer, more comfortable bus to live in by taking the time now while we are working to make this dream come true! And we have so much to be thankful for! These past four months living on the bus have gone relatively smoothly. We have proved even if only to ourselves that we can do this!